Goose at Pierce's Marketplace, Portage. Derek Lavigne and Carole Lavigne hold up two plastic geese that were found at Edgewater Greenhouse on April Fools Day. Dozens and dozens were found in Portage at businesses and homes April 1. Despite rumors about where the geese and their outfits came from, the real story behind the "goosing" is still unknown. It’s no fooling: Portage was “goosed” on April Fool’s Day. Just who did it and why remained a mystery until — well, the goose was cooked. Plastic lawn geese, all wearing unique, tailored outfits, quietly appeared at businesses, churches, parks and other areas early Sunday morning. Kim Himmel, a resident of West Cook Street, was one of the residents who received one. 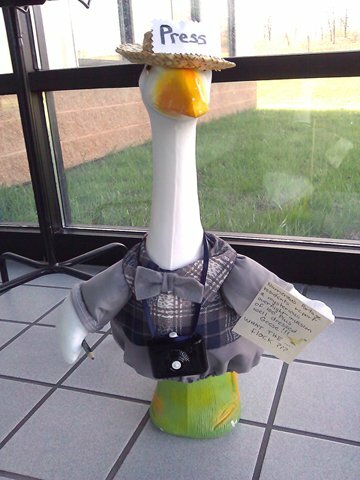 The Daily Register received its own well-dressed goose outside its front door, bearing a note that “100 plus” of the geese were scattered around. According to Assistant Chief Kevin O’Neill of the Portage Police Department, patrolling officers first noticed the geese shortly after 1 a.m. Sunday, after a report of two of the geese in a front lawn. Then they realized they were all over Portage’s south side. Later, they saw the “nicely dressed geese” in various outfits all over the city. Two officers spoke briefly with the geese-laying culprits, four women in a van. “They explained to our officer it was a memorial to a friend who had passed away,” O’Neill said. The officers were not able to obtain more information from the geese-layers because they received an urgent call they had to respond to, O’Neill said. In all, 132 geese were placed around Portage, including churches, the fire department and several private residences. Portage United Methodist Church said they received an angel goose. “Look how the town is talking. It is so much fun! They are all over town!” said Shar Kuhl, secretary at United Methodist Church. Megan Manthey owner of Smart Woman at Cook and Wisconsin streets, said they received one dressed with a pearl necklace and a feather boa. “They are adorable! It is very creative and they went way out on this ... someone put a lot of thought into it,” she said. Elle Lohr at the Tangerine store on DeWitt Street said she didn’t get one. “Maybe they didn’t know how to dress it. How do you dress an organic goose?” she said. Carole Lavigne, manager of Edgewood Home and Garden, said she saw two geese in front of the business while on her way to church Sunday morning. She said she saw the yellow and black stripes on one of the geese from the road. After pulling into the parking lot and examining them closer, Lavigne realized that one was dressed up in a bee outfit while the other wore a dress, hat and carried an umbrella. She said everyone seemed to be talking about the geese and sharing their theories about where they came from. Carol Nett and other patrons of Riley’s Bar and Grill said it’s been the talk of the town. Nett said she’s had some fun talking to other people trying to figure out who goosed the city. 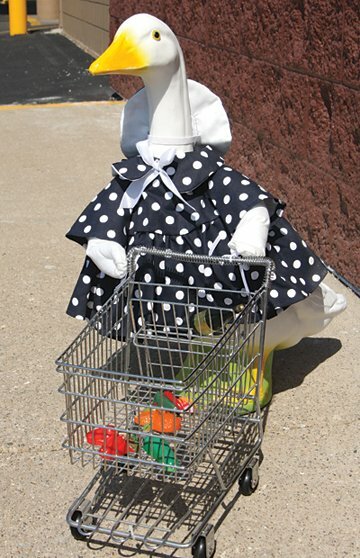 At Pierce’s Marketplace, the goose was pushing a shopping cart. “Thank you to whoever had such a cleaver idea! It made us giggle all day and wonder who might be the April Fool,” said Vicki Voss, customer service manager. Among the not-guilty but topping the list as a suspect was West Cook Street resident Rosemary McTier, whose concrete goose — a gift from her husband and with many seasonal outfits — has decorated her front porch for about 15 years. As a goose fan, she appreciates the gifts — all of her West Cook Street neighbors received their own geese. The average retail cost of a goose, fully dressed, is about $30. Doug Williams, owner of D.W. Sports Center, said he loves their “fisherman” goose. It took a lot of effort, he said. A very short list of the more than 125 places that were “goosed” included the Portage post office, Edgewater Greenhouse, Pierce’s Marketplace, VFW Hall, The Mercantile, St. Mary Church, Norm’s Pit Stop, Corner Pocket, Blue Star Park, Portage Soundworks, Hair Sensations, DW Sports Center, the World War II Museum, Antique Mall, Bennett Law Office, Smart Woman, Elks Lodge, Portage United Methodist Church, First Presbyterian Church, Divine Savior Healthcare, Schultz’s Farm (next to Culver’s on New Pinery Road) and the Portage Do-It Center. Is your new plastic pet not yet pictured in the Daily Register or on our website? We’d still like to display your goose photo and hear your story. Email photos with your name, day and evening telephone numbers and the address where the goose was left to Julie Cutsforth at jcutsforth@capitalnewspapers.com or call 745-3511. Plastic geese descending on Portage? Who could have hatched such a plan?